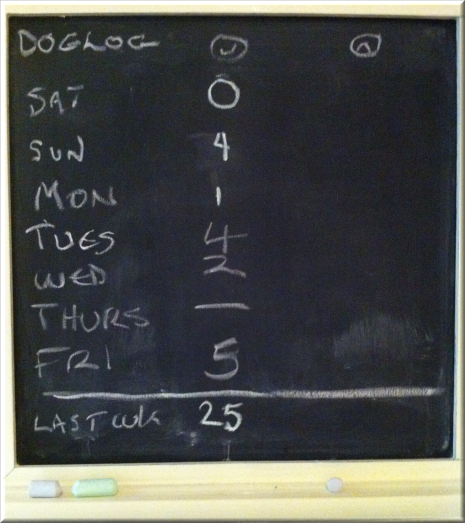 This is the “dog log”. 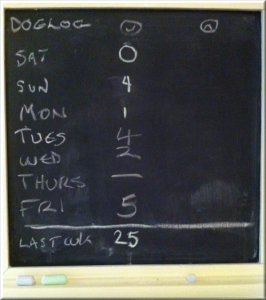 It was an idea that Kim came up with earlier in 2012, mainly to work out how many dogs Theo was meeting on his weekly walks. In the picture you can see the chalk board that hangs in our kitchen. There are smiley faces and sad faces (we’re simple folks really). We update this weekly. This week, he met 16 dogs and they were all positive interactions (including a long play with Gus, a cane-corso mix). It started raining a lot more this week and we didn’t do any dog training classes, so the numbers were down on the 25 dogs we met last week. That said, we’ve learned that this isn’t a high numbers game, rather it is about affirming the positive. Theo is a sociable dog and he loves to play with other dogs but when he’s on lead we’ve found that he gets stressed when other dogs charge at him, particularly if we’re in a narrow path in the woods. This means that we’re much more active on our walks now that he is on-lead most of the time, to make sure that Theo is happy and has enough space to relax if he is meeting new dogs. Hopefully that explains things, but if you have any questions just let us know. Because Theo is part husky, when we let him off-lead, the distance he likes to keep from us (his radius) is pretty big. This means that if we let him off, he runs out of sight. Unfortunately, when you mix this with his innate curiosity and hunting instincts, it can spell trouble. More often than not, he simply runs around and eventually comes back to us. However, it is like rolling dice and every now and then he catches the scent of something and goes for hours. If you’re wondering about recall training, let me assure you, we’ve tried it all! In the last few years, we’ve paid hundreds of pounds to various dog trainers. We’ve certainly developed a great bond with him, but if the deers can be scented or the wind is blowing in a new season, you can have as much cheese or meat as you like.. but Theo’s out to play for a while and there’s no way you’re catching him! The trouble with the boy is that he is clever, and easily bored. I saw this when we were doing agility training. Most dogs have a weak spot, it may be food, toys, even water bottles, something that will always catch their eye. Theo isn’t most dogs. He will try something a few times, like in agility he quite enjoyed running the course and jumping up and over the obstacles, but only a couple of times. So, when you’re standing in a field watching a beautiful sunrise with the mists feathering over the grasses, and you wonder where Theo’s gone.. well, if you can see a tiny ginger dot in the tree-line about 3 fields away, that’ll be the boy!